Sweden seems like a progressive country to the uninformed. It has parental leave policies for both genders. While mothers have always availed themselves of such leave, fathers seemed reluctant. So the parental leave laws have changed over time to encourage fathers to take time off of work after the birth of a baby. At present, two months of the 390 leave days allocated for parents must be used by the father or they are lost. Consider contemporary family life in Sweden. In the past, new parents split 390 days of paid leave however they liked—monthly, weekly, daily, and even hourly. Women used far more of it than men. But today, new fathers no longer rush back to work, leaving the mother to raise little Sven all by herself. The reason for the change? Smart public policy. On the surface, this sounds quite progressive. The United States lacks similar leave policies and American men often feel discouraged from taking time off from work for family matters. They fear they will be looked down upon, ridiculed, or passed over for promotions if they take more than a short time away from work for a new baby. But the reality is that Sweden’s progressiveness is merely a veneer over a solid core of the same false feminist male-bashing that predominates in the Western world. Children in Sweden, you see, are treated as property of the mother. If the mother doesn’t want to share, she simply starts making false abuse allegations. No proof is required, obviously a mad mom’s word is more reliable than all the evidence in the world. She will be quickly and easily rewarded with sole custody, marginalizing the father to no more a few days per month with the children. Many fathers quickly see even this small amount of contacted whittled down to just a few hours of supervised visitation, supervised because obviously fathers cannot be trusted with children if the mother says so. In Sweden, as in the United States, men are guilty upon accusation and must struggle to prove themselves innocent, a task which is effectively impossible in many cases. After all, if you are a man who was accused of some crime that nobody else saw and there is no evidence of it occurring or not occurring, how are you to prove that you didn’t do it when a mom says you did? You can’t, so her lies win. If a father fights for equal child custody, Swedes will consider him a brute. If he is beaten senseless by false accusations from a malicious mom, his life in tatters, he will suffer in many ways including by very limited contact with his children. Then Swedes will consider him a deadbeat. Being a father in Sweden is a losing proposition, the only chance of success is at the whim of a woman. But if she changes her mind, for any reason — her affair, her drug abuse problem, etc. — the father is instantly a degenerate who should be banned from seeing the children without the watchful eyes of the state closely monitoring his every move. This is no different, really, than the United States and many other nations in which men are not even second-class citizens in all matters involving families and children. Not only is this extremely unfair, it contributes to a wide range of social problems including gender conflict, parental alienation child abuse, and harming children’s educational attainment and mental health. To their credit, many women understand these issues very well and fully support equal rights. Some of them are strident enough about it to actively support both the father’s rights movement and going to significant effort to ensure their own ex-partners stay involved in their children’s lives. Unfortunately, there are more than a few naysayers remaining. Some of them are quite intent on not only denying equal rights but going so far as to even any messages that advocate for changes they do not approve. A lot of children in Sweden are upset about deprivation of access to a loving parent, generally their fathers. Four Swedish high school students, Sara Sivesson, Jerry Wallén, Sandra Atas, and Oskar Krantz, set out to expose Sweden’s human rights crimes against children and fathers to the world. They produced a video which they submitted to Amnesty International for a human rights video contest. Their video explains what happens to so many Swedish fathers who long to spend time with their children but who are prevented from doing so by the typical false feminist tool of false accusations. The video made it to the finalist stage. The students were of course very excited by this. But then a woman’s violence organization in Uppsala reportedly demanded that Amnesty International remove the video from the competition and its website. On September 9, 2010, law enforcement finally caught up with parental child abductor Melinda Thompson, formerly Melinda Stratton. 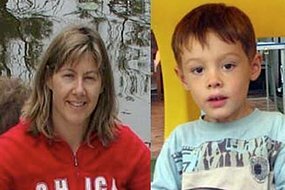 On April 24, 2008, she had disappeared with son Andrew Thompson after leaving Australia to go to Germany on a Singapore Airlines flight from Sydney to Frankfurt. Her professed intent was to keep the boy away from his father, Ken Thompson of New South Wales, Australia. After more than a year searching for his son, in mid-2010 he traveled to Europe to do a bike tour across the continent in search for his son. He biked over 3000 miles across nine countries raising awareness of his missing son. He wore clothes covered with pictures of Andrew. Ken discussed in an interview with BBC news about how he discovered Andrew had been found. He had stopped cycling in Germany between Nuremberg and Stuttgart to check his email. There was an anonymous message stating that Andrew had been found and Australian authorities would contact him. Parental alienation child abuse is a worldwide problem. As most of our news-oriented coverage is focused on the United States and Canada, some may not realize that parental alienation and destructive family law courts are plentiful outside of North America, too. This story highlights one troubling alienation case in Singapore. 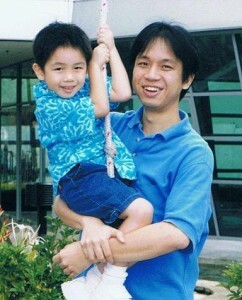 Wee Cheng of Singapore, one of our many readers worldwide, is a divorced father of a young boy named Adriel Cheng. His limited 8 hours of contact per week hasn’t been honored in two years. The courts will do nothing but reward the mother’s contempt for their orders. Adriel hasn’t seen his father almost half a year because of interference being enabled and enforced by human rights violators in the Singapore schools and family courts. While Singapore has a fine reputation in many areas, Mr. Cheng’s experience shows that the government of Singapore is engaged in human rights violations and is intent on enabling parental alienators to abuse their children. In Cheng’s case, the courts and schools are directly involved in access blocking and interfering with the parent/child relationship. They have even threatened police action against him for attempting to spend time with his son at a school carnival. We recently received notice that the American Coalition for Fathers and Children is working on putting together graphics and slogans for signs, banner, brochures, flyers, and other literature to support its goals of enacting shared parenting legislation and reform of child support and domestic violence laws across the United States. They are putting together working groups to create this content and have some people with professional backgrounds in graphic design already on board. They would like to get more skilled volunteers involved. They are also seeking ideas to develop into signs and other materials to help parental rights and family law reform groups get their messages out to the general public. We’ve seen some of the signs and banners similar groups have created (California Coalition for Families and Children comes to mind) and would like to encourage them to share their work and ideas with ACFC. ACFC aims to build a library of such content and share it with like-minded groups and individuals. California billionaire Donald Bren had two children with former girlfriend Jennifer McKay Gold. They had a 13 year long affair, but they never married and he had little involvement with the children. Gold claims that Bren promised he would be involved in the children’s lives and that his failure to do so is a violation of agreements between them. Therefore Gold and the children, David Bren, age 18, and Christie Bren, age 22, decided to sue Donald Bren for $134 million in back child support. Bren is very secretive and media-shy about his life, income, and assets. Estimates are that his assets may be worth around $12 billion, largely derived from real estate development in Southern California. Forbes Magazines has placed him 16th on its list of the 400 richest Americans. He and his attorney claim he paid about $10 million in child support, vacations, cars, and other payments and gifts to Gold and the children during their childhood. He felt obligated to ensure they would receive advanced education through graduate school if they wished, received luxury German cars when they started to drive, and live in an upper middle class standard of living well beyond that of most of the US population. Clearly these children were not in need of more money. Gold disagrees on the amounts. She and the children also claim that he owes far more because he didn’t stay involved in their lives. Until you’ve been through a divorce in a child abusing nation like the United States or United Kingdom, you likely have no clue of the extortion and abuse families are put through by the courts and governments of such nations. But that may change as more and more fathers with ties to the entertainment and mass media industries start to open up about their experiences, particularly how their children and they are blocked from contact with each other with the full cooperation of the courts in what amounts to state-sponsored parental alienation child abuse. Noted writer Louis de Bernieres, author of Corelli’s Mandolin which was later turned into the movie Captain Corelli’s Mandolin starring Nicolas Cage and Penelope Cruz, has recently experienced state-sponsored parental alienation himself. He seldom gets to see his children Robin and Sophie, all of five and two years old respectively, as the courts engaged in the usual sexist practice of marginalizing the father. He’s now joined UK’s shared parenting group Families Need Fathers to fight against the ongoing abuse by UK courts and government against children and families. In my previous article Extreme BPD / NPD Behaviors Are Internally Triggered, I discussed the puzzling ways in which normal circumstances seem to trigger abusive behaviors from Borderlines, Narcissists, and other personality disordered abusers. My advice to those who can do so is to get away and stay away from these people as they are a serious danger to your own mental health, even your freedom and your life, if you continue to have anything to do with them. Unfortunately, not everybody can easily extricate themselves from the abuse without severe consequences. This is particularly true for parents of children whose other parent is a Borderline or Narcissist. Staying in the children’s lives means staying in the line of fire of the abuser. Leaving is likely to subject the children to even more abuse. Often the abuser has focused most of her or his rage against their former partner or spouse. But if that parent leaves, the rages, abuses, and emotional manipulations are not going to stop. They will probably be redirected at somebody else close to the abuser as loved-ones are the tops targets for these sick people. The children are a likely target for even more abuse than they have already received. This chronic abuse with no escape (as the healthy parent has disappeared) is likely to create severe psychological damage, even personality disorders, in these children as they have even less means to defend themselves against one of these sociopaths than an adult does. Recently a reader of our site wrote a comment about our article Talking With A Borderline citing how it didn’t show how non-Borderlines trigger the negative behaviors associated with Borderline Personality Disorder. The comment seemed to be intended to place some of the blame for Borderline behaviors on the people around them, particularly people who are essentially the targets of Borderlines who do not suffer from a personality disorder or engage in abusive behaviors themselves. This is mostly a mistake in my view. It also makes me wonder if the comment came from somebody with a Borderline son or daughter or who is personally suffering from BPD and therefore may be prone to blame-shifting as a means of coping with his or her own guilt or shame. Most of the people around a Borderline are not abusive, yet they may trigger reactions in Borderline akin to an actual abuser even when they aren’t displaying an iota of aggression or hostility. In most of these situations, the Borderline perceives aggression or abuse in their own minds, even when a neutral disinterested person would say none is present, and then launches into a reaction that is similar to what they might do if there actually was an abuser trying to harm them. The trigger is much more internal, in the mind of the Borderline, than external. This is what makes is so difficult for others to understand why the sociopathically inclined individuals, be they Borderlines, Narcissists, or something else, behave as they do. Borderlines are sometimes said to suffer from “emotional dysregulation” because they react in extreme ways to normal stimuli. This extreme reaction in many cases developed from their experience as child abuse victims, an experience most of them share, and trying to find ways to avoid being abused again. Many of them have found that extreme reactions including false blaming, projection, lying, and other behaviors associated with Borderlines and Narcissists alike are reasonably effective at either drawing fire away from them and making somebody else the target of their abuser. Other times, their extreme behaviors may somehow justify in their own minds why they are deserving of abuse, perhaps giving them some delusional feeling of control over the abuse. Over time, many of them may generalize these maladaptive behaviors by applying them to people who are not abusing them but by whom they are reminded of what it feels like to be abused. We’re looking for feedback on your experiences with exchanges and visitations, particularly those involving those either professionally or informally supervised. We hope to write some articles over the next couple of months on what works, what doesn’t, and to include comments on particular service providers. If you’d like to be anonymous or to include your name, either is OK with us. Many parents end up suffering the high expenses and interference of supervised visitations because of false allegations made by a malicious ex and how abusive courts regard parents as guilty until proven innocent, even when there is no evidence to substantiate the allegations. Yet despite the hassle and expense, sometimes these court ordered services actually do end up helping to clear up the false allegations. That’s because some of the providers are competent and honest enough to write accurate reports of how the children behave around both the falsely accused parent and the accusing or alienating parent and are not afraid to give examples of why it appears there are false allegations and parental alienation at work. We’d like to help guide our readers to use facilities that are competent, fair, and honest and that use exchange and visitation monitoring techniques that are not overly intrusive yet can head off a lot of problems. If you’ve got recommendations for or against particular providers and techniques, it would be terrific if you would take a few minutes to write them down and forward them so others can benefit from your thoughts.